It’s the final day of the Blog Hop today. I’m kinda sad to see it wrap up, as I have enjoyed perusing all of the designer’s blogs over my morning cup of coffee. I hope you have all enjoyed the fun projects and topics of the day too. In addition to that, I have enjoyed reading all your comments. They are always such an encouragement and with that, I am ready to blog on! It’s also your last chance to comment on each designers blog, so you will be eligible for the great prizes. Thanks to everyone who participated! 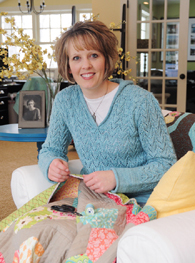 Today the featured designer is Pat Sloan. Click here to see her project. 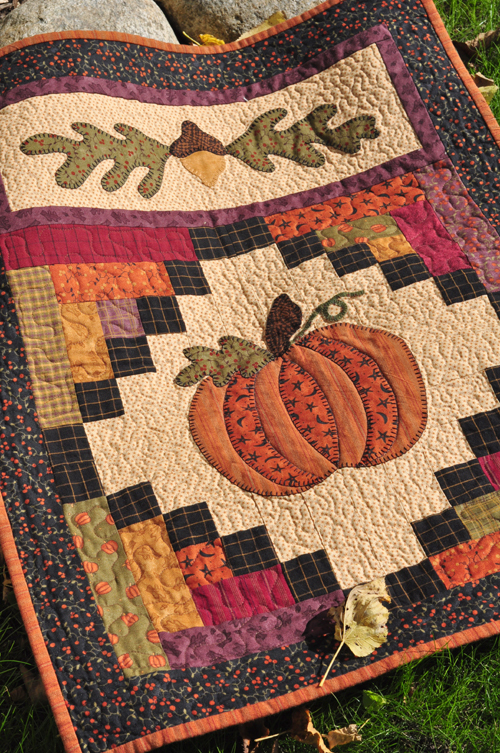 Today’s topic of the day is Fall Quilts. I may have mentioned that this is my favorite topic, as I love fall colors, fabrics and themes! Plus, many of you have already asked about some of the fall quilts I’ve shown in my previous blog hop posts, and I’ll talk about them below (and tell you what pattern or book to find them in). 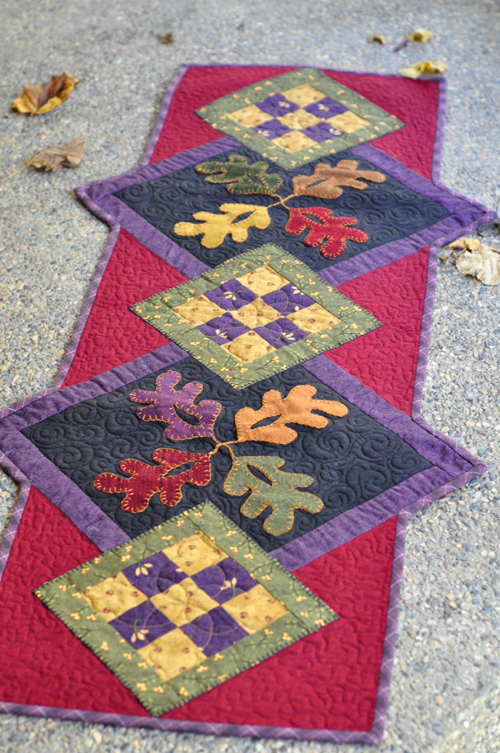 It’s called Emmy’s Autumn Runner and can be found in my book “Gifts for all Reasons“. I like the combination of the wool applique on the cotton quilt. Many of you have commented that you haven’t tried wool yet, and this is a good way to give it a try! It’s called the Everyday Table Topper and can be found in my book “Charmed and Dangerous“. It’s perfect for Charm Squares. Some of you that are up on fabric designers might notice that many of my fall quilts are made from fabric lines designed by the über talented Sandy Gervais, who also happens to be a designer on our Fall-O-Ween blog hop. Her fall lines are my absolute favorite. A friend of mine inspired me to add a Jack-O-Lantern face, as that is what she did on hers when she made this pattern. 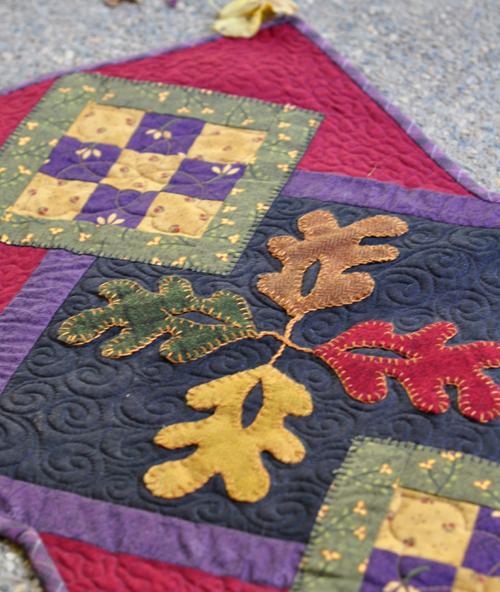 And, last but not least, Maple Harvest, also from the book “Favorite Quilts from Anka’s Treasuers”. BTW, this book is not being reprinted, so get it while you can! I have a few more fall quilts in my stash, but I decided just to show my favorites to keep this post from getting too long. Carrie – Miss Rosie’s Quilt Co. 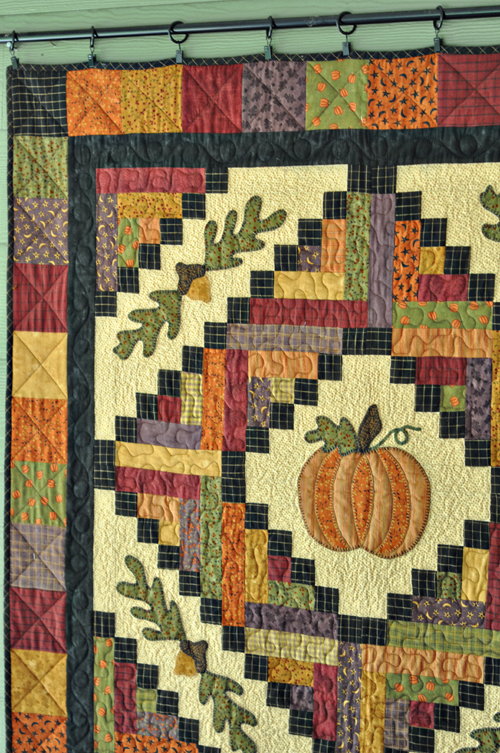 This entry was posted in Machine Quilting, Pattern of the Week, Quilting and tagged A Season of Change, Charmed and Dangerous, Everyday Table Topper, Fall Quilt Ideas, Fall-O-Ween Designers Blog Hop, Favorite Quilts from Anka's Treasures, Harvest Time, Maple Harvest. Bookmark the permalink. I love your designs in every season. Thank you for sharing your skill and creativity with the rest of us! God Bless! Wow your quilts have a great inspiring factor to then ,they what me to go make fall quilts right now. 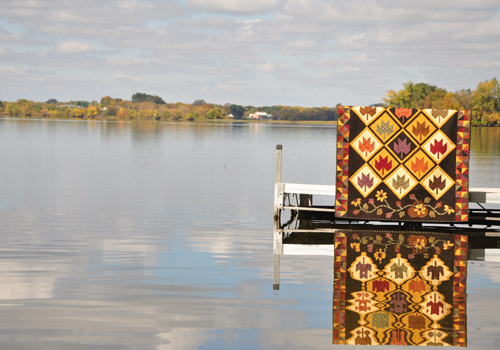 The fall leaves on the water is lovely and I hope you will make more fall inspiring quilts in a new book . Thank you for the lovely pictures ,Happy quilting. Beautiful pictures of beautiful quilts. You are very talented and I enjoy your patterns. Thanks for the blog hop – it’s been fun. Harvest Time inspires me. I bet that would be pretty changed up in the pumpkin and leaf areas to make it for other seasons as well. Pretty colors! Heather, your quilts are just so beautiful! I love your decorating style – and I’m glad you’ll keep on blogging! Thanks for all your work on the blog hop, it has been a lot of fun. Beautiful quilts. Thanks for sharing. It’s been a very fun blog hop. Your quilts are beautiful! I love your book Charmed and Dangerous! Such cute, easy patterns! 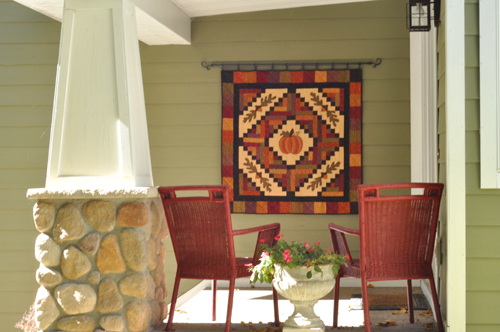 I love your Harvest Time quilt hanging out on the porch! And the smaller version is just too cute! Thanks for all your inspiration! I would like to thank all the designers for sharing their patterns, recipes and memories of Fall-o-ween’s past! This Blog Hop has been so much fun. Happy Autumn! 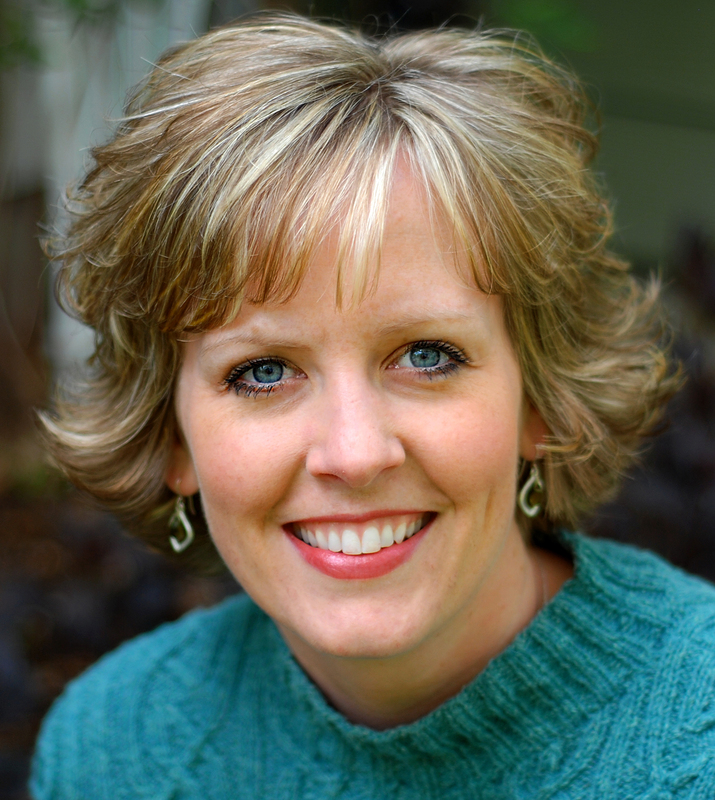 Thanks a million…Heather! I have so enjoyed this Blog Hop! Look forward to it each morning with coffee in hand! Thank you for all you do for us quilters out here! I absolutely love your work along with all the other designers… you have made this so fun to do! Keep up the GOOD work! Happy Fall! I cannot agree more, Sandy’s Fall Lines are STUPENDOUS !! Her fabrics look wonderful made in your patterns. Thank you Heather – for all your Quilt photos today and the Blog Hop which I have truly enjoyed. Beautiful quilts, thanks for sharing. My favourite is one made from scraps of my childrens’ clothing collected over 18 years…yes, lots of scraps and several moves. The kids enjoy looking for their favourite scrap from their first day of schoold dress, a party dress, etc. 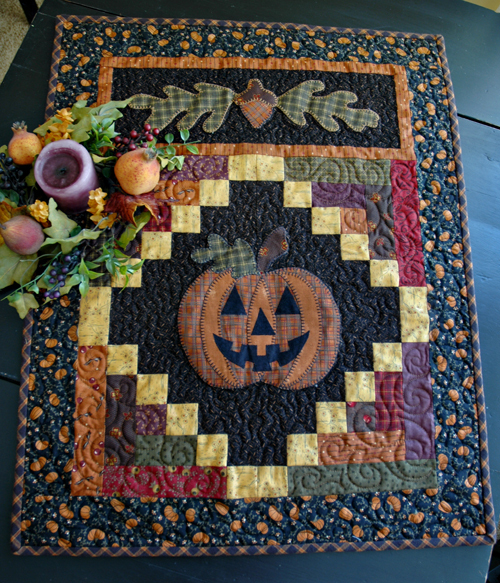 Heather…..love all your quilts….the jack-o-lantern is too cute. Thanks for sharing and Happy Autumn. This blog hop has been absolutely wonderful ….in every way possible. Sorry to see it end. You ladies are magnificient!!!! and sooo funny….the recipes are fabulous!!!! !the pictures….I’ve got to say all of you are sooo talented. It has been like Christmas morning for 10 days opening up the link to your quick and easy projects. Love every one of them. I journeyed into blogland just a few months ago…..WHOW!!! What have I been missing all these years. I joined Debi’s Fall-into-fall Giveaway and I am in “awe” and completely overwhelmed about blogland. If you find a minute and I know you have a gazillion emails to read please stop by and say HI…I would be honored and thrilled. If you can’t I will understand completely. Thank you so much for taking the time to participate in this Fall-O-Ween Blog Hop. 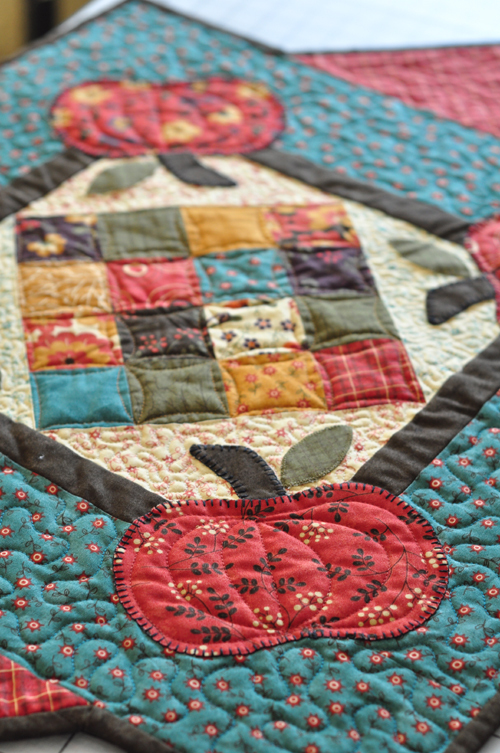 Hard time picking a favorite from the quilts today…love ’em all! I have enjoyed everyone’s participation in this blog hop – it has been a lot of fun and very inspiring. Lovely pumpkin table toppers! I’m so glad I signed up for your blog! I can look forward to lovely thoughts, photos and inspiration on a (hopefully) regular basis. I have many of your books/patterns already and now I will know when your new projects come out. Your quilts are just gorgeous! I love all of the beautiful fall colors. Love Love Love the eye candy!! Thank you so much for the quilt parade. Heather, I enjoy following your blog and especially love all the quilt photos. You’re patterns/fabric are an inspiration to me. Thanks. 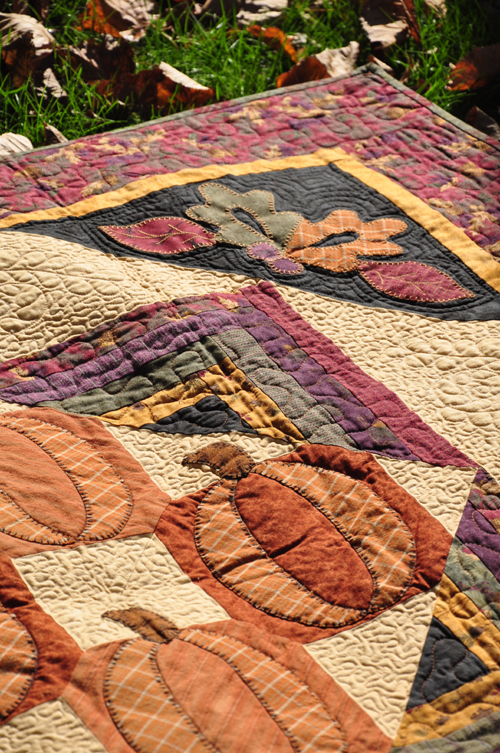 Your quilts are so beautiful – do you do your own quilting, too? I will miss the hop in the morning with coffee too. It has been alot of fun reading and collecting the patterns. I’ve enjoyed getting to know all of the designers a little bit better too. And don’t forget the awesome recipes. Thanks so much! I love all of your autumn projects and the ways you have displayed them! Thanks for sharing them with us. I’m sad to see this end, too! Love your quilts and the fabrics used. This has been so much fun and really motivating. Your quilts are wonderful! You have such nice patterns, and your fabric choices are always stunning. I am so inspired! 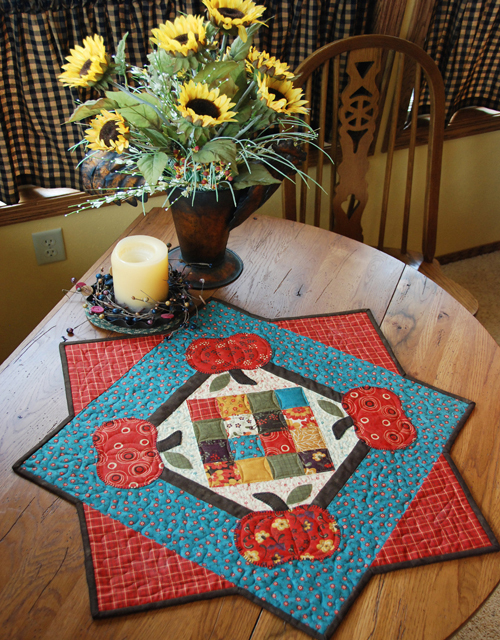 I have enjoyed this Fall blog hop so much and viewing all the Fall quilts, table runners and table toppers. It has so inspired me to gather up some Fall fabrics and get busy now that Fall is finally here in Ct. Thanks for the inspiration. It was just what I needed! 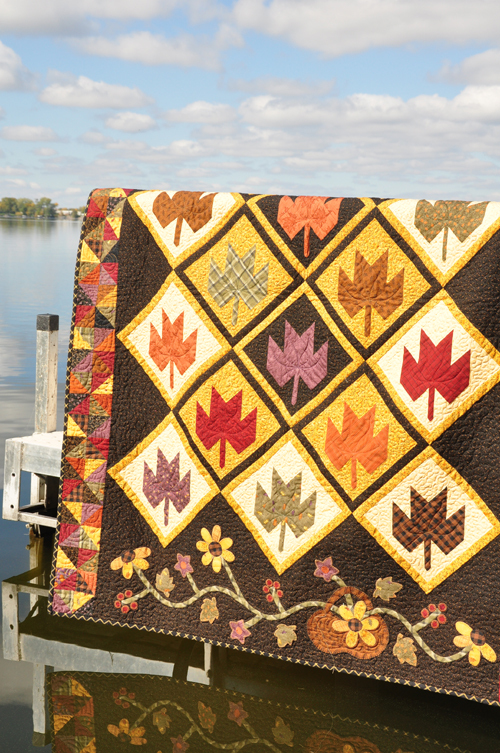 Beautiful quilts – I love Maple Harvest and the picture by the water and fall leaves in the background just gorgeous. Thanks for all the inspiration and the endless possibilities with the all patterns. Really beautiful quilts! I love Sandy’s fall fabrics, too! I’m currently working on a BOM with the Essence line! 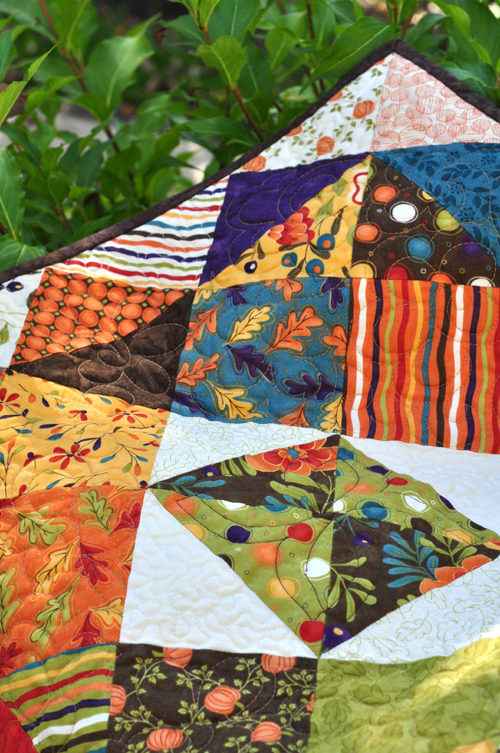 What beautiful seasonal quilts…It’s been a fabulous blog hop…thanks for all the fun! Your quilts are so beautiful. You are so talented. Thank you so much for sharing. Enjoyed the “hop”. Seroiusly, thank you very much for all the names on these quilts and table runners/mats. Such wonderful colors too in all of those. 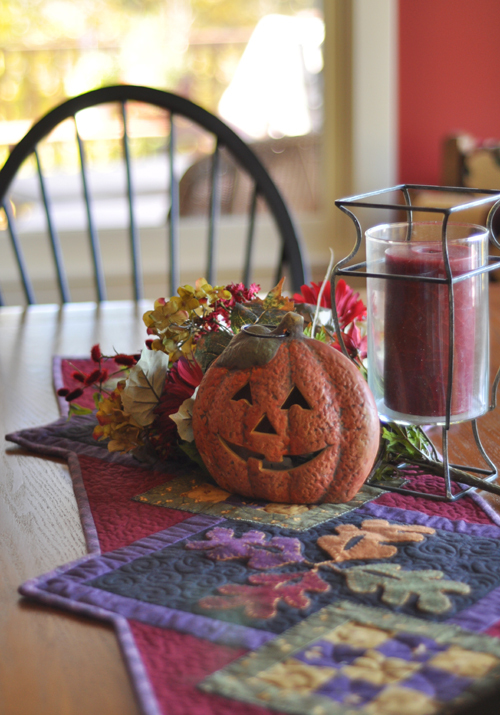 I love fall, & will have to take another look through all of the fall-o-ween blog hop. Just fun to refresh with each season. Love it all. The Fall o ween blog has been very enjoyable & inspirational. The stories, the pictures, the projects, all have been great. Went to a local quilt shop today & found your book on favorite quilts, so that has been added to my book collection. It does have lots of wonderful ideas. Thanks for the blog hop and for letting all of us get to know each one of you talented ladies a little better…like finding new friends! Beautiful quilts. Your participation in this blog hop was much appreciated. I would like to express a heart felt thank you. Happy quilting! Heather, your quilts area absolutely beautiful. I too was wondering about the quilts in some of your pictures and I’m glad other asked so you could share! now more of your books to order 🙂 Thanks so much for participating in the blog hop, lots of work by all involved and love the creativity and inspiration each one has given. Boy oh boy … what a wonderful quilts. I just LOVE this time of year !!! Thanks for sharing those 10 days of fun !! Thank you for all that you have shared over the past ten days during the blog hop. I have never worked with wool so will enjoy making the project you provided. I had to chuckle on the “haunting” day as I am not interested in haunted houses or scary movies but what you offered was very creative. The quilts you shared with everyone today were just gorgeous! I checked to make certain that we have the quilt book that is almost out of print and we do!! I hope that you and your family enjoy a great autumn season. Good luck as you continue your creative efforts! Thank You for the fun blog hop!!! It was a blast!!!! I am already counting the days until the next one. I agree about Sandy’s fabrics. I have more of her fall designs than anyone else. I don’t know how I missed your Gifts for All Reasons, but now I have to make a search for it. I love the boldness of the red and purple together. Beautiful! Love your quilts! Fall is definitely here! Thank you for sharing your tips, recipes, quilts, pics & stories. I will be looking for many items I read/seen on this blog hop during my area’s (WI)shop hops. I read your blog quite frequently & enjoy your blog roll also. It truely inspires me in many ways. Thank you & bless you. 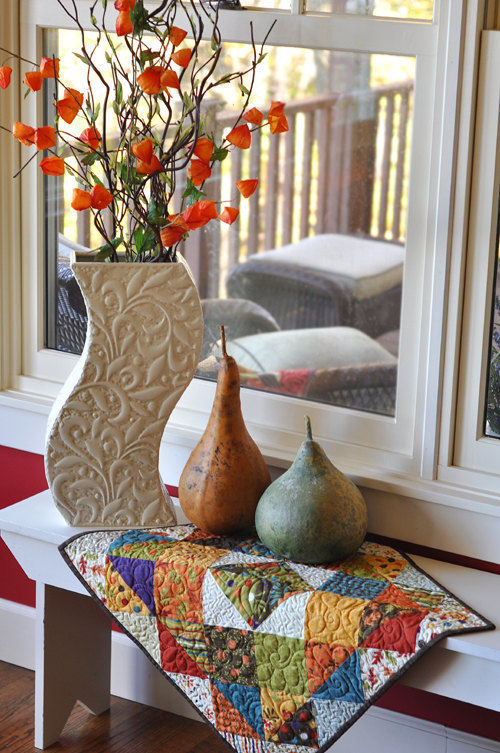 I so love your fall quilts! I have the book Favorite Quilts From Anka’s Treasures. I love everything in it. Thank you for sharing yourself with us. Beautiful quilts – the colors are yum. I’m actually climbing out of lerkdom because I had to let you know that every time I open your blog and see the beautiful fabrics in your header I get inspired to run home from work and start working on something new. Of course, they frown on that here, so I have to wait until quitting time. You’re a great inspiration and I wanted to say thank you. I love your blog. Thanks for sharing your beautiful work. I’ve been pointing and staring, 2 bad habits which are hopefully okay to do, when it comes to quilts! So, thank you for sharing the info about the beautiful projects! Your quilts are so beautiful!!!! for your tween, I hope my birthday party ideas for tween’s helped you. I would like to get some of your patterns. How do I order them?